While driving any time of year, be aware of electrical hazards you may encounter on the road. If you are driving after a storm, keep away from downed power poles, downed power lines, and damaged electric equipment. Downed and damaged electric equipment can still carry electricity. Coming in contact with the equipment could shock or kill you. If the car is in contact with electrical equipment or power line, it could remain energized. Stepping outside could be deadly if your body becomes the path to ground for electricity. Even if a power line has landed on the ground, there is still the potential for the area near your car to be energized. Call 9-1-1 and wait for the utility to arrive on the scene to ensure the line is de-energized. Stay inside the vehicle unless there’s fire or imminent risk of fire. If you must get out because of a fire, jump clear of the vehicle without touching it and the ground at the same time. Then hop with feet together so there will not be a voltage difference between your feet, which would give electricity the chance to flow through your body. Hop as far away as you can. Remember: do not get out unless you have to. 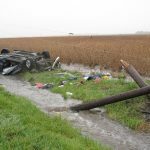 Several years ago, four Indiana teenagers were in an accident with a power pole. Fortunately, they had seen a demonstration about the dangers of electricity in car accidents earlier that week at their school. Not only did the teenagers know to stay in the car, they warned people who approached the car to stay far away.